The double tank problem is a basic example for a switching system. It contains the dynamics of an upper and a lower tank, connected to each other with a pipe. The goal is to minimize the deviation of a certain fluid level in the lower tank. The problem was introduced and discussed in a variety of publications for the optimal control of constrained switched systems, e.g. [Henrion2014]The entry doesn't exist yet. (Link: Henrion et al.) and [Vasudevan2013]The entry doesn't exist yet. (Link: Vasudevan et al.). The two states of the system correspond to the fluid levels of an upper and a lower tank. The output of the upper tank flows into the lower tank, the output of the lower tank exits the system, and the flow into the upper tank is restricted to either [lt/s] or [lt/s]. 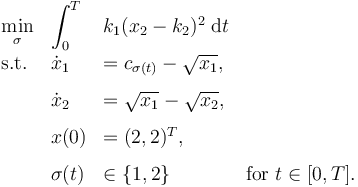 The dynamics in each mode are then derived using Torricelli’s law, as shown in constraints 1 and 2. The objective of the optimization is to have the fluid level in the lower tank equal to [m], as reflected in the cost function. [Henrion2014] The entry doesn't exist yet. [Vasudevan2013] The entry doesn't exist yet. VASUDEVAN, Ramanarayan, et al. Consistent Approximations for the Optimal Control of Constrained Switched Systems---Part 2: An Implementable Algorithm. SIAM Journal on Control and Optimization, 2013, 51. Jg., Nr. 6, S. 4484-4503. This page was last modified on 14 March 2019, at 19:07.